Kelly Sims Gallagher previously received funding from the U.S. Environmental Protection Agency and recently was awarded a new grant from the U.S. Department of Defense. She previously worked as a Senior Policy Advisor in the Office of Science and Technology Policy. One of the president’s most important responsibilities is fostering science, technology and innovation in the U.S. economy. The relationship between science and policy runs in two directions: Scientific knowledge can inform policy decisions, and conversely, policies affect the course of science, technology and innovation. Historically, government spending on science has been good for the economy. Innovation is estimated to drive approximately 85 percent of economic growth. Not only does it provide a means for “creative destruction” within the economy, it also results in reduced costs for products and services that consumers demand. The United States prides itself as the most innovative country in the world, but how did it get that way? Many famously disruptive technologies were invented in the United States – the internet, shale gas fracking and solar photovoltaics are three examples – and subsequently led to the growth of major American industries and associated jobs. Such inventions are the fruits of investments and effort made both by the private sector and the U.S. government (usually at different points in time). President-elect Trump has made clear he intends to boost the economy’s growth rate and supporting science and technology should be a vital part of his plan. So how does an American president settle on research priorities for the country? And once he has a science and innovation agenda, how does he move it forward to eventually seed new industries that have the potential to generate jobs and improve the country’s competitiveness? Where does the president get scientific advice? Every president since World War II has maintained a personal science advisor in the White House to inform key decisions about domestic and foreign policy, although some presidents proved more attentive than others. The very first science advisor, Vannevar Bush, demonstrated his value during World War II as head of the U.S. Office of Scientific Research and Development (OSRD). OSRD’s mission was to marshal and coordinate civilian and military scientists to develop and deploy new technology in wartime. OSRD helped to establish the Manhattan Project and was the origin of the military-industrial complex. (Perhaps unsurprisingly, Bush later founded the Raytheon Corporation.) Bush also pushed for the creation of the National Science Foundation. Congress established the Office of Science and Technology Policy (OSTP) in 1976 to provide the president and others with scientific and technological expertise related to domestic and international affairs. It’s part of the Executive Office of the President, and its director (and associate directors) must be confirmed by the Senate. Although the director does not have cabinet rank (as does, for example, the chairman of the Council of Economic Advisors), OSTP works alongside the other offices in the White House, including the Domestic Policy Council, the Council on Environmental Quality and the National Security Council. The 1976 act also authorized OSTP to lead interagency efforts to develop and implement sound science and technology policies and budgets. Typically, the director of OSTP also has a separate appointment as special assistant to the president in order to serve as his private science advisor. Many people in Washington seek the president’s ear, ranging from cabinet secretaries, senators and congressional representatives to lobbyists. But the president usually relies most heavily on his own personal staff within the Executive Office of the President. The Office of Science and Technology Policy thus is enormously influential in clarifying and implementing the president’s science, technology and innovation priorities. Once a president determines his science and innovation priorities, his main tool to influence the country’s research agenda is the federal budget. His priorities may spring from concern about U.S. competitiveness in certain industries or sectors, or from a sense of opportunity about where new science or innovation could contribute to the public interest or national good. Of course, the president’s budget request must be approved by Congress in order for the spending priorities to be fulfilled. Innovation research is an uncertain and risky investment, which is why the government has traditionally shouldered the burden for pre- or noncommercial science and technology research and why universities do most of this type of research. Federal funding for basic research is a crucial long-term investment in the nation’s future, and has traditionally garnered bipartisan support since businesses tend to focus on already proven technologies that are close to commercialization. United States Office of Science and Technology Policy. The Department of Defense manages the largest portion of the federal R&D budget (US$78 billion in the FY17 budget) compared with all other nondefense R&D combined, at $68 billion. The National Institutes of Health comes in second at 0.77 percent with $30.9 billion. 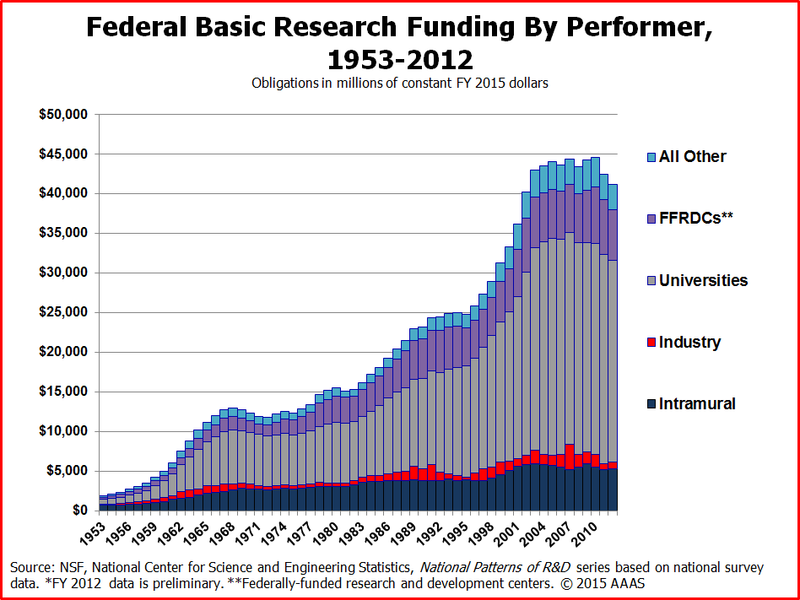 The Department of Energy and NASA have far fewer resources, with R&D funds of about $14 billion and only $12 billion, respectively. These research dollars go to our world-renowned national laboratories, to the private sector and to support the research of professors and graduate students in American universities. Some of these investments will directly bear fruit for the economy, and others will do so indirectly through spillovers. The skills of the U.S. workforce are created in part through investments in STEM education and through their work experience over time. Those doing the research accumulate knowledge and expertise that can contribute to improved understanding and problem-solving. These people can then take their skills to commercial companies which create economic value, or they continue to innovate in nonprofit research institutes or universities to address problems in the public interest, such as how to reduce air pollution or improve lifesaving treatments for diseases ignored by private firms. Of course, high-risk research sometimes yields high-value rewards, especially when the government partners with the private sector. The internet was originally invented by researchers associated with the U.S. Defense Advanced Research Projects Agency, shale gas fracking from both Defense and DOE investments at Los Alamos National Lab and research on the human genome from NIH. Private firms like Microsoft and Google, Mitchell Energy and Pfizer capitalized upon taxpayer investments in science and technology to develop these industries. President Obama’s science advisor, John P. Holdren, has provided advice on advanced manufacturing, national security, STEM education, space policy, climate change, energy policy, cybersecurity and more. So during the Obama administration, the Office of Science and Technology Policy indeed worked with agencies to clarify science and technology priorities consistent with the president’s wishes, but it accomplished much more than that. The OSTP worked to make more than 180,000 federal datasets and collections available to students, entrepreneurs and the public. It produced the first-ever U.S. innovation strategy, launched the Precision Medicine Initiative (providing more than $200 million to accelerate a new era of personalized medicine), embarked on a Cancer Moonshot initiative and launched the BRAIN initiative that resulted in a doubling of research funding for Alzheimer’s research at NIH between 2012 and 2017. Initiatives like these are a hopeful down payment on results that usually bear fruit years later. Through the efforts of the SunShot and wind R&D programs at DOE and private firms, for example, the United States now generates more than three times as much electricity from wind and four times as much from solar as it did in 2008. That’s because the cost for renewables has come down rapidly – solar costs 1/150th what it did in the 1970s. One example of a problem that we understand much better than we did 30 years ago as a result of governmental scientific investments is global climate change. Due to sustained federal investments in Earth observations, geophysical research and global circulation modeling, we now know how much the world has warmed, how rapidly mountain glaciers and Arctic ice are retreating, how much and where precipitation is changing, how much soil moisture is reducing and what it would take to avoid significant global climate disruption. Long-term, depoliticized investments in this kind of measurement science are crucial to understanding global change and the fate of the planet. Although President-elect Trump seems to find little value in facts, he clearly wishes to reinvigorate the U.S. economy. He cannot do so without improving access to high-quality STEM education and accelerating U.S. investments in science, technology and innovation. Scientific advice could also provide President-elect Trump with some good ideas for revitalizing manufacturing in the United States, which he’s pledged to do. Indeed, the current President’s Council of Advisors on Science and Technology (PCAST) produced an excellent report on accelerating U.S. advanced manufacturing in 2014. President Trump can use science and innovation to achieve his goal to restore American greatness, whether it is through launching a new “moonshot”-type initiative or creating advanced manufacturing jobs. With history as a guide, appointing a respected science advisor and director of the Office of Science and Technology Policy will help him accomplish his goals.